Libby on the Label: #52 Ancestors Week 28 - "Music"
#52 Ancestors Week 28 - "Music"
There are so many family names that I wish I'd had known about. I really like them. They're old timey, but still classic. Eunice is one. There has been a Eunice in my paternal line since Eunice Hazen Willard in 1736. My paternal aunt is a Eunice, although she goes by her middle name. Another repeating name that I love is Minerva. Minerva was the Roman goddess of music and poetry, so I thought I'd look into 3rd great aunt Minerva Anne Treleaven Tweed who was a music teacher! Maybe her lyrical name was an omen. There is a musical superstar in the family, but since she lived to be over 100 years old I wrote about her for Week 3 - "Longevity.Frances Marr Adaskin was a gifted pianist and accompanied her husband who was a violin virtuoso. They toured Canada, the USA, Great Britain and Europe and performed often for CBC radio. They were both appointed Officer of the Order of Canada, Harry Adaskin in 1974. Frances received the honour on December 15, 1976 and was invested as a Member on April 29, 1777. Her award was for "a life devoted to music as an accompanist of international repute and as a soloist and teacher". Auntie Fran's mother was musical as well. My great grandmother Eunice Little Marr played the piano and had a beautiful singing voice, according to my dad. Minerva Ann Treleaven (Tweed) was Eunice's aunt, my great great grandmother Esther Melissa Treleaven's (Little) sister. According to the Census of 1881, at 22 years of age Minerva was married with two children, and listed as "music teacher" under occupation. I don't think a lot of women worked after they got married, and with a two year old and a baby, I'm impressed! The Treleavens were a very close knit family. I wrote about a big gathering they had for my 3rd great grandparents 60th wedding anniversary here. John and Eunice Willard Treleaven married on January 1st, 1844 on Amherst Island, which is about 10 kilometers west of Kingston, Ontario. Eight of their ten children were born there. In 1861 they moved their growing family to Lucknow, Ontario. Records show that John operated a general store in Lucknow until 1882. That is when seven of their nine living children and their families moved with John and Eunice to Manitoba. Only two daughters, my great great grandmother Esther Melissa and her sister Elizabeth Jane Treleaven remained in Ontario. 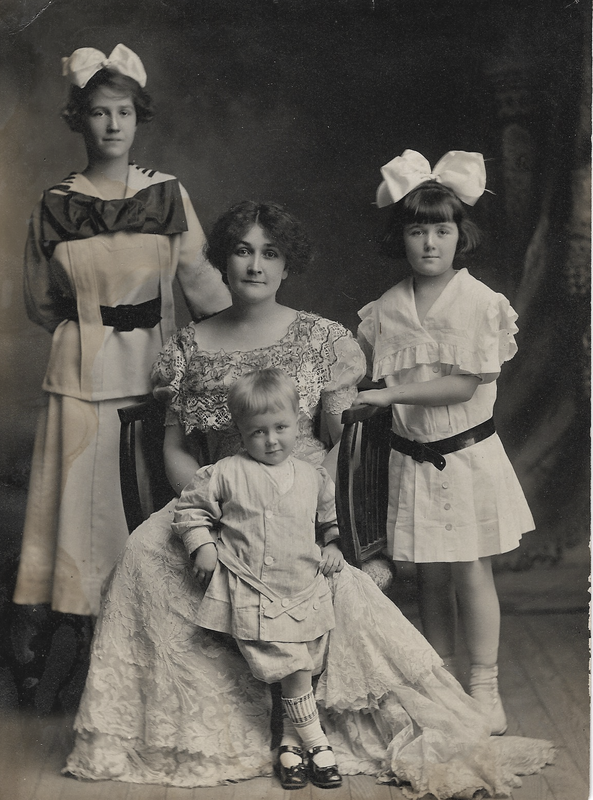 Minerva Ann Treleaven, her husband George Fenyk Tweed and their two oldest children, Florence Minerva and Harvey Russell Tweed made the move to the Northwest. Minerva's sister, Alvina Loretta Treleaven married George Tweed's brother, William Errington Tweed in Lucknow, Ontario in 1882 just prior to moving with the family. All nine of their children were born in this new frontier. The Treleaven clan lived very close to one another, farming and homesteading. No mention of Minerva being a music teacher here! Min and George's farm was next door to her parent's, John (1820) and Eunice Treleaven. Min looked out the window one day and saw Indians setting fire to the prairies. She quickly hitched up a team to a wagon, put her four children in the wagon, and raced to her parents. When they (the Tweeds) returned to their homestead next day, all was burned. That would be about 1887 or 1888. I have a feeling that Minerva might have been a name passed down through the Willard family. My 3rd great grandmother, Eunice Willard Treleaven named a daughter Minerva, and her brother, George Willard also named a daughter Minerva. Not much is known about their mother's side of the family. No Birth, Death or Marriage records, or even a name that can be verified 100%. Her name is probably Lydia. I wouldn't be surprised at all if there is a Minerva somewhere on her side of the family, maybe her mother or sister. I found this old photo recently. 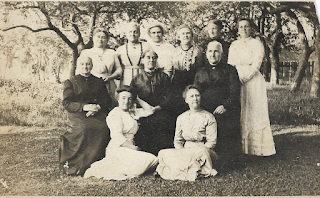 I recognize several of the Treleavens, and I am pretty sure Minerva is in the top row, second from the left in the darker dress. 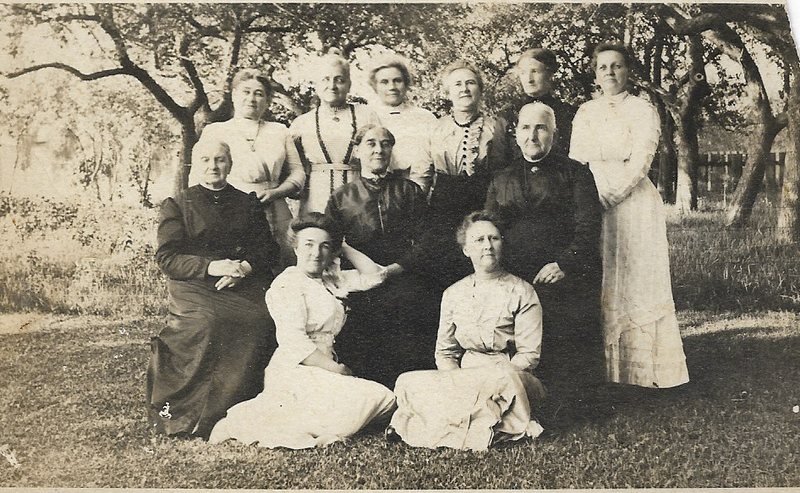 My 2nd great grandmother is on the far left, top row. I don't know where this was taken, but the amount of traveling involved to be together in one place! Most likely they were either in Manitoba or Ontario. Minerva passed away in 1923 at age 63, so it has to be before then. That takes a strong commitment to stay in touch.